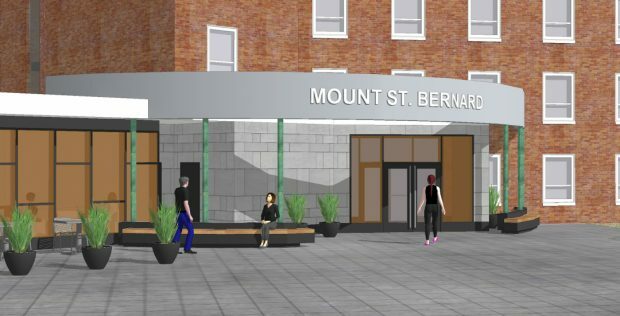 Nycum provided Architectural and Interior Design services for the Conceptual Design for Design-Build packages for renovations and additions to the Mount Saint Bernard Complex at St. Francis Xavier University. Mount Saint Bernard was a former women’s college designed and built facing a courtyard. The lowest two floors of the complex are predominantly academic spaces, with three residence floors above. 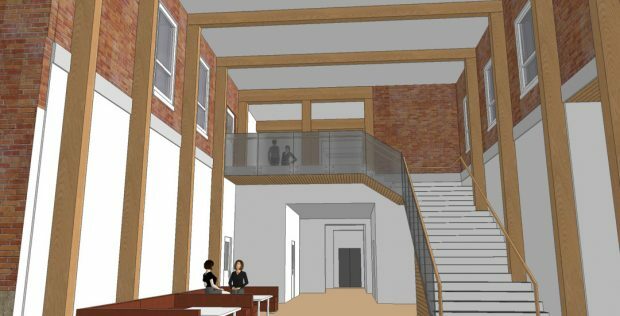 The renovations introduced outward-facing aspects to the building to create stronger links to the rest of campus, provide an identity to the School of Nursing and encourage interactions between and with residence students. In addition to major changes to circulation within and around the buildings, upgrades to finishes were designed throughout. The design team worked with stakeholders at the university to develop a conceptual design that enhanced natural circulation patterns and respected the existing structural grid while opening up the claustrophobic interior to exterior views and light as much as possible. Informal learning spaces and lounges were distributed throughout the academic spaces and designed to encourage student engagement with designs that accommodate a wide variety of learning styles. Accesssibility aspects were of particular importance in the residence renovations with major interventions in the shared bathroom facilities and accessibility upgrades to several of the 229 bedrooms. Early stakeholder consultation sessions utilized a Pairwise Ranking tool to help the Student, School of Nursing, Residence Representatives and Facilities Management staff representatives identify shared and agreed-upon priorities across the various competing interests. The concepts developed by Nycum were used to procure the services of a Design-Builder.